Best spectating crew on course! 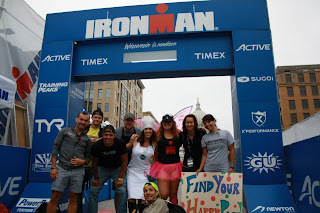 I thought it would be best to write this up while still deep in my Ironman hangover. If you are wondering what an Ironman hangover is it is the same thing as a hangover caused by alcohol just 10x more awesome. It is the result of long durations of exercise the previous day, screaming your lungs out, or in the case if you are racing its caused by driving your body into the ground until you can't walk. 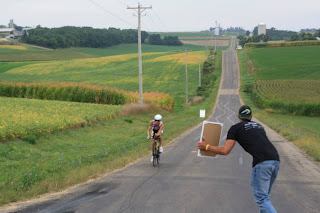 Ironman Wisconsin is one of my favorite races, whether I am racing, spectating, or volunteering it is a day on the calendar that I am always looking forward to. The day started with a 4:00 wake up call with our spectating group meeting at Lindseys house (home base) just a few miles off the run course. We made it to the Monona Terrace and parked in my super secret spot (if anyone that was in my car mentions this spot you will be treated to many flat tires for the rest of your life while racing) that gave us a short walk to snag our spots to watch the swim with an easy exit for the bike course. We staked out a spot on top of the helix, perfect to watch all the nervous athletes walk down to the start and see them come back after the swim. 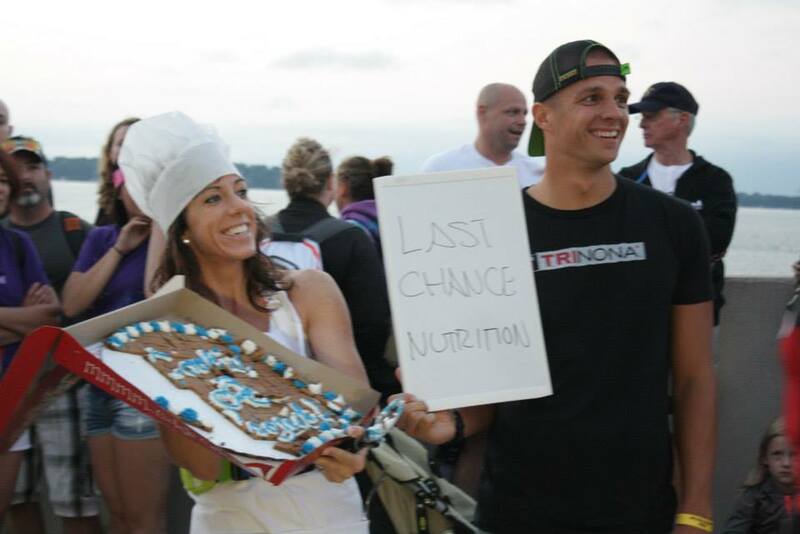 Also it was a great place for last chance nutrition and "Cookie Handouts" for those wanting to top off their calories for the day. 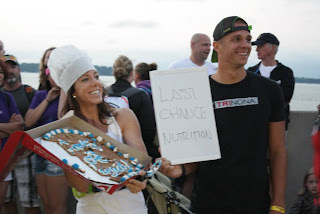 Check out the awesome cookie Jen Anderson brought to the race after starting the "Cookie Project" this past May. The cannon fired and the race was on! We watched the first few minutes of the awesome sight that is a mass start to an Ironman triathlon while being thankful we had the chance to be on the other side of the race and watch today. Less then an hour later and we had our first pros coming out of the water. Gerlach led the Madison contigent out of the water with Blake and Paul not too far behind. We caught Jackie in good position of the female race and watched some of the age-groupers come in before we snuck off to get a good spot on the bike course. As the pros looped by the masses of the age-groupers came through, slowly but surely the course was filled with dream filled and determined athletes. I did my best to pass on positive energy with "free high-fives" to all those passing by, judging by all the smiles of the competitors that passed us I think we all did a job well done. We ran with competitors up the hills, shouted words of encouragement, and did whatever we could to keep the smiles going. Great work team! Laurie hard at work with a HUGE smile on her face! As we returned to Madison to watch the run we made a quick stop the Qdoba for a quick hunger fill. This was the most quiet our group was all day as we filled our bellies full of burritos. 5 minutes after that stop I was already hungry again, but we had a marathon to watch. 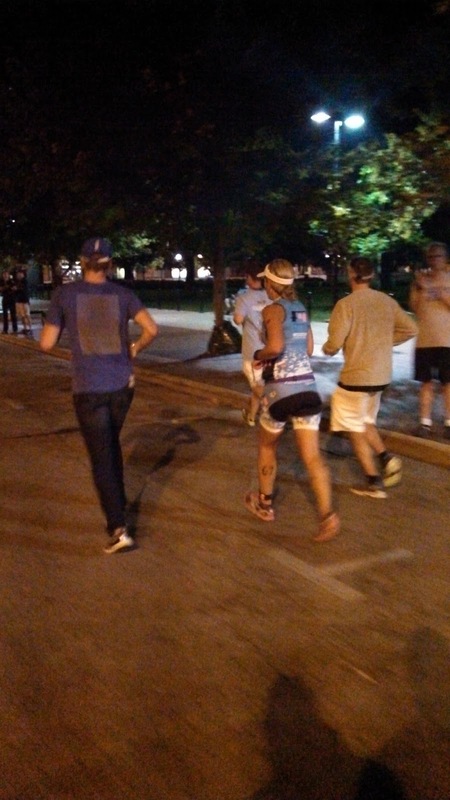 We drove down University Ave just in time to see Blake starting the early miles of the run. Then we staked out a spot at the stadium for awhile.We were slowly realizing that Jackie was slowly pulling in the female leader. We made it our mission to find her as much as we could on that course and give her the best support and encouragement we could. Of course having a "biker gang" rolling 8 deep helps, so we were able to catch her multiple times as she closed in on her first Ironman win. I also snuck around course trying to find Blake as he ran the fastest marathon of the day and a new run PR for himself, unfortunately he was too fast and I was only able to catch him a couple times. I don't think I have ever seen Blake so strong on the run before, great work! As the evening started it was time to watch the age-groupers shine, they are the true heart and soul of the race. Everyone gets to the starting line in a different way, different motivations, stories, complications but all share one common goal....finish. I was able to find some friends on course who all looked great and putting in some solid performances. 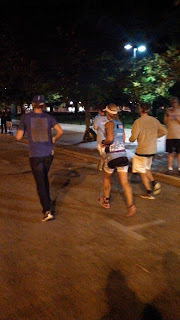 Later in the evening I was on my bike solo and was able to meet up with a few fellow BBMC'ers around miles 23-25 and talk to them while they got ready to run down the finish chute. Great work Wynn and Jackie (who ran the whole marathon! 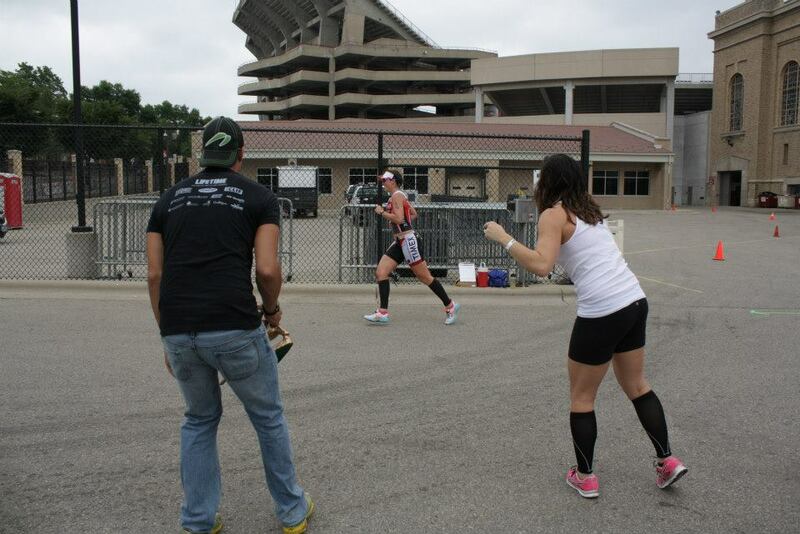 ), also great to see Candice finish her Ironman race with a solid last few miles. At the 15 race hour mark I met up with Summer and we headed to the finish line but not without a quick caffeine stop to fuel us for the last few hours. 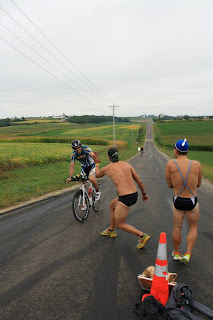 We hung around the finish and then had the idea to get back on our bikes and back the course backwards and see what the course was like in the final hour of an Ironman. As we rode the course it became apparent that many were still on course. We rode further back into the marathon course and soon we realized some of the athletes would be really close to that midnight cutoff. It was surreal to be on course that over 2500 athletes had just covered, that was the path to so many dreams being chased down all day and was now dark, quiet, and peaceful with the most determined athletes about to bring it home. We turned back home at the picnic point turnaround and did our best to rally in the final athletes while cruising in on our bikes. I found one volunteer who left his station to run the final 5k with a solo triathlete also named Ben. I hung with them for a bit, gave my words of encouragement but knew it was bleak for him. As we got off the bike trail I found a group just ahead pushing two runners to keep moving forward, I had no idea of their story at the time all I knew was again mathematically it was looking bleak for the father-son duo. As we approached the last aid station at mile 25 I could her the boom boxes playing the "shots" song, only to look at Summer and laugh at the horribly timed choice of music. Then out of nowhere, the previous athlete Ben, who was being helped with a volunteer passed the father-son duo and was hell bent on getting to the finish in time, it was like he had rocket boosters attached to his feet, again looking at the math of the distance left, time left and his pace I thought it was bleak at best for him to reach the finish in time. We slowly cruised up the course we found an older female named Susan McNamee who was on the brink but so close. Less then 10 minutes left in the race and she was giving it her all, we turned onto the capitol loop and you could hear the crowd on the other side of the capitol ready to call her name. Once we knew she would make it, Summer and myself staked out spots at the finish line and watched Susan bring it home just in time! 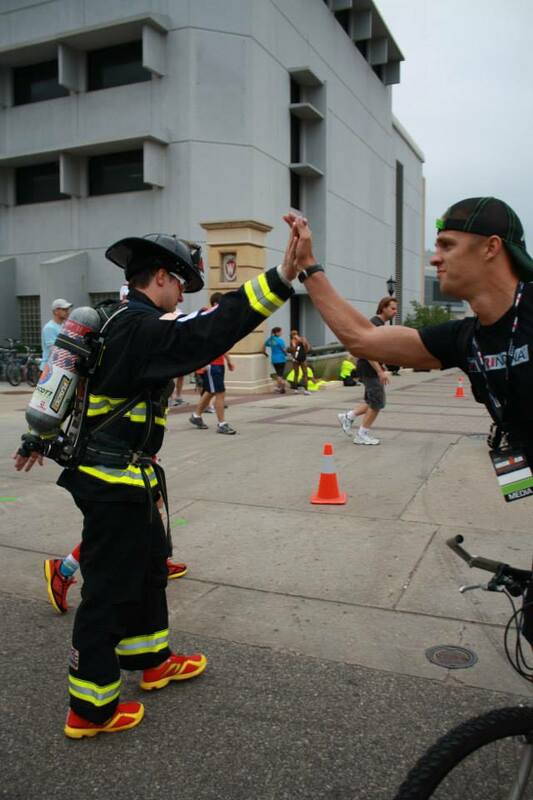 We both had a chance to catch the final finisher almost 17 hours after the race started and we high-fived each other. Then....out of nowhere that father-son duo came running down the chute, they somehow found the strength and made it. What!? How? 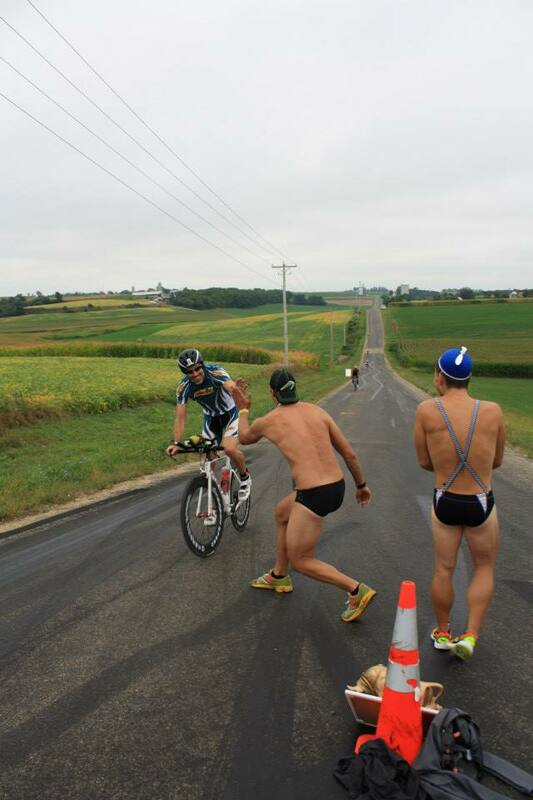 As I stood and couldn't believe it, we heard Mike Riley ready to call in one last finisher! Ben surprised all of us and came running down with whatever he had left and made it just in time, literally he had seconds to spare. In the end it was an awesome day from the moment we stepped foot on the terrace and felt the nervous eager excitement to the final seconds of a memorable finish. 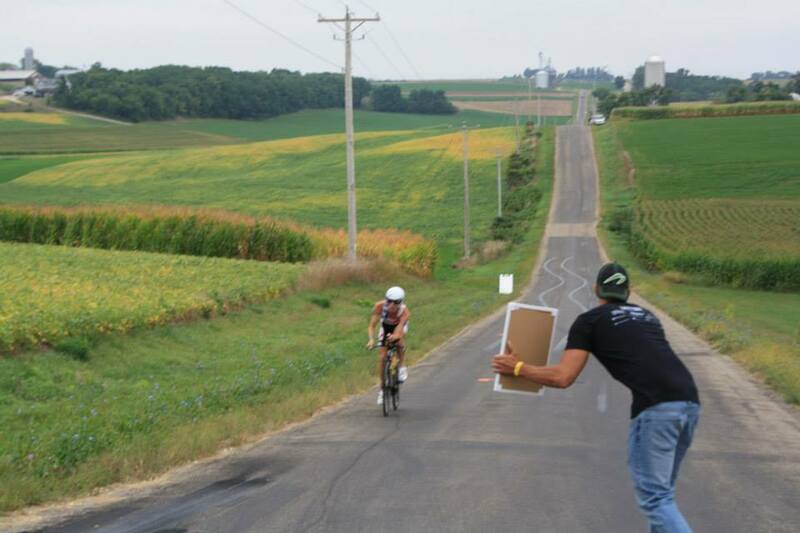 But it was those final finishers that stick out the most for me in this 2013 edition of Ironman Wisconsin. Having the chance to see where they were on the course with how little time they had and having the odds stacked against them it was truly inspirational to see them finish what they started. Lastly, I just wanted to mention how in those final miles I wondered what these athletes "stories" were that were on the course so late. When I woke up to read about the father-son story, not only did they have a great battle, but an awesome father-son relationship that tested its limits in this race.